"What you have is an obvious need for more capacity in the mental-health system," says Dr. Ken Duckworth, a Harvard professor, psychiatrist and medical director of the National Alliance on Mental Illness (NAMI). A need for more capacity is certainly true in Arizona. According to a 2005 report from the Treatment Advocacy Center, a nonprofit mental-health organization, the state had 5.9 publicly funded psychiatric beds per 100,000 people, compared with a national average of 17. In addition, NAMI gave the state's mental-health system a C in 2009, a step up from its D grade in 2006, but with vast room for improvement. Part of Arizona's low marks stem from its large Native American and foreign-born populations, which are harder to reach and treat, as well as the state's rapid overall population growth and rural regions, which are underserved by medical professionals. Still, the state was not an outlier. In 2009, NAMI gave just six states B grades, while 18 got Cs, 21 got Ds and six got Fs. None received an A. Regardless of resources available, however, the problem with someone like Jared Loughner is that, without a court order, he would not have received treatment without a self-referral. 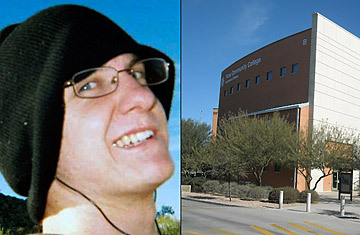 It appears that his community college, which kicked him out, rightly protected its own population  at least one student and one teacher told the New York Times they feared Loughner would bring a gun to class  but left the rest of the community vulnerable. It would have been up to Loughner to seek treatment, a move many psychiatrically ill people would never make. "Most young people who develop a psychiatric illness  particularly a psychotic illness in which they've lost the ability to discern fantasy from reality  don't have a lot of insight into the fact that they are ill," says Duckworth. He points to a recent online NAMI survey that found that schizophrenics suffered an average of nine years between their onset of symptoms, which often first appear in the late teens and early 20s, and diagnosis. See TIME's photos of people mourning the victims of the shooting.